Growing awareness towards health concerns, adulteration issues in traditional sweets as well as changing taste preferences of Indian consumers are resulting in a shift towards chocolates. Additionally, increasing disposable income, changing lifestyle and availability of sugar-free and dark chocolates are further contributing to the growth of chocolate market in India. Moreover, improving rural distribution network in the country would boost the India chocolate market forecast revenues over the coming years. According to 6Wresearch, India chocolate market size is projected to grow at a CAGR of over 19% during 2017-23. Milk chocolate segment captured majority of the India chocolate market share in 2016, however, dark chocolate segment is likely to exhibit highest growth during the forecast period, owing to health benefits associated with it. Further, with growing trend of offering chocolates as gift, premium chocolates is expected to witness huge acceptance over the coming years. Moreover, introduction of international brands, availability of a variety of flavors and expanding online chocolate distribution are the key factors catalyzing the growth of chocolate market in India. Additionally, more than 70% of chocolate consumption is from urban consumers and the country is posing huge opportunity in untapped rural segment. With relatively mature European and American markets, the global chocolate market players are eyeing on Indian marketplace. The India chocolate market report thoroughly covers chocolate market by material, category, products, types, packaging, distribution channels, and regions. 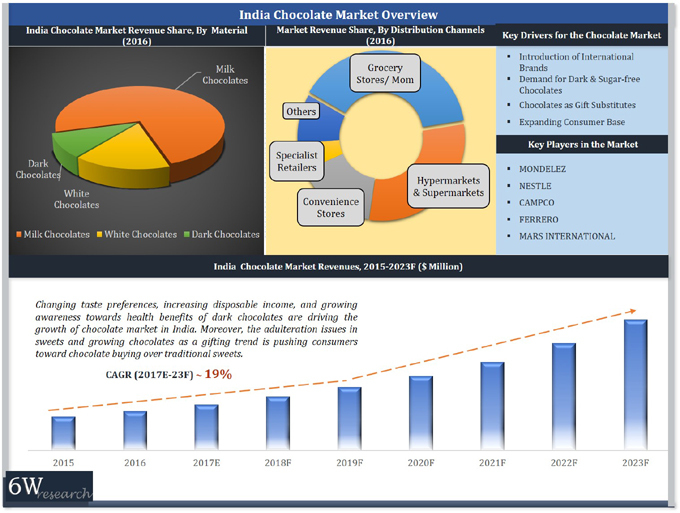 The India chocolate market outlook report provides an unbiased and detailed analysis of the India chocolate market trends, opportunities/ high growth areas, market drivers which would help the stakeholders to decide and align their market strategies according to the current and future market dynamics. 16.1	Mondelez India Foods Pvt. Ltd.
16.3	Ferrero India Pvt. Ltd.
16.4	Mars International India Pvt. Ltd.
16.5	Hershey India Pvt. Ltd.
16.6	Gujarat Cooperative Milk Marketing Federation Ltd.
16.8	Lotus Chocolate Co. Ltd.